You know how I mentioned that we go through a lot of eggs at our house? Six dozen last week to be exact. This week I was able to get my hands on 11 dozen farm fresh eggs and I am so very excited. It’s obviously the simple things in life that make me happy…proven by the fact that having 11 dozen eggs available this week for my cooking pleasure has made me almost giddy. If you haven’t tried our Easy Breakfast Casserole, please go get yourself some eggs and try it. 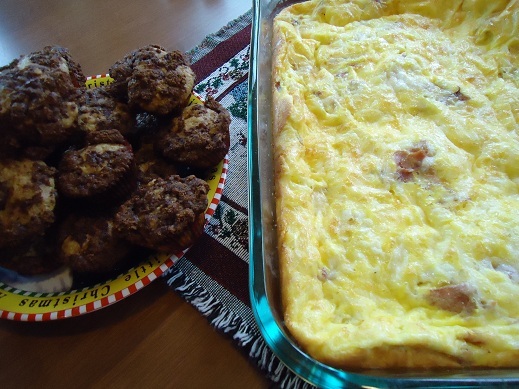 It’s the simplest little breakfast casserole I’ve ever made and my family eatsthe whole pan. Actually…they don’t eat the pan. Hungry boys though they are, they do have their limits. 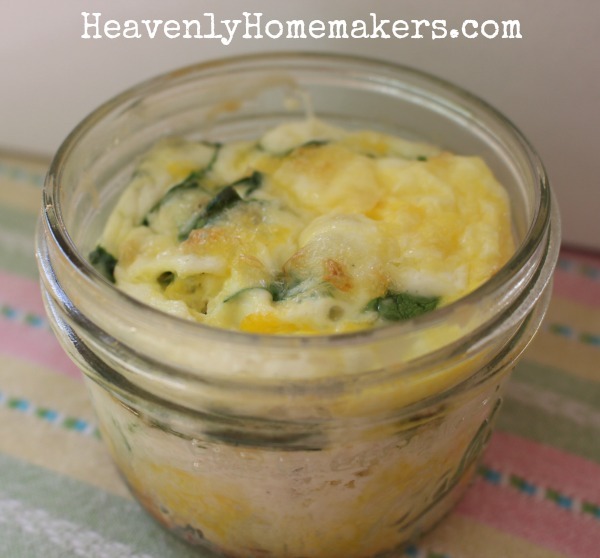 I have now adapted the Easy Breakfast Casserole recipe to become an easy, make-ahead Mini Crustless Breakfast Quiche recipe. You can make these and serve them fresh, or you can bake them the night before and re-warm them in the oven the next morning for breakfast. You can even bake them and freeze them to have available for future grab and go meals. You can make them for lunch or brunch. 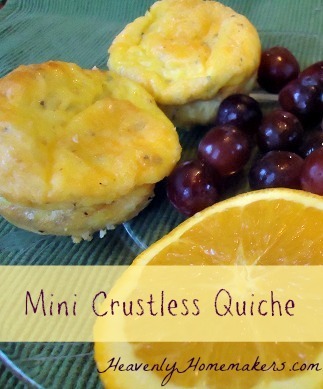 These little quiches are super versatile! Begin your quiches by whisking together the eggs, cream, salt and cheese in a large mixing bowl. Sprinkle in any “add in” ingredients you wish (a total of 1 cup of add-ins). Stir them around with a fork. 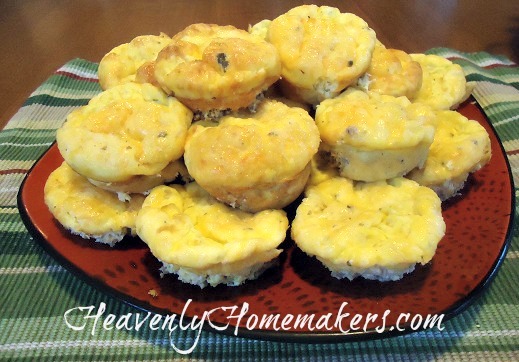 Scoop mixture into 24 well buttered regular sized muffin tins. Bake in a 350° oven for 20-30 minutes, or until the middle of each quiche doesn’t jiggle. 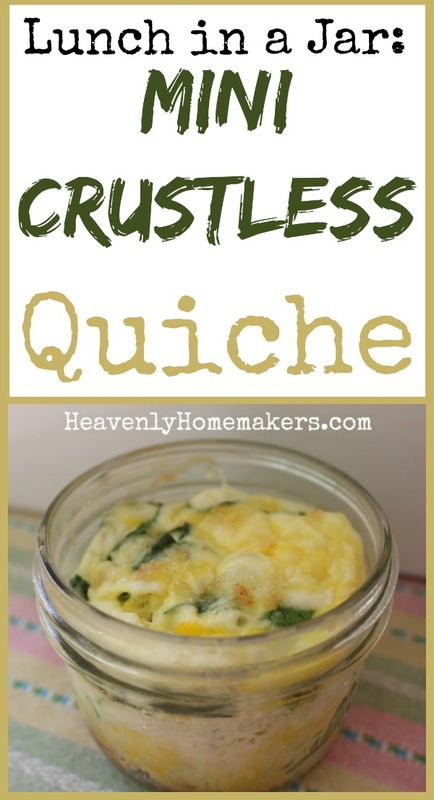 Obviously, you can cut this recipe in half to make 12 regular sized muffins sized quiches! 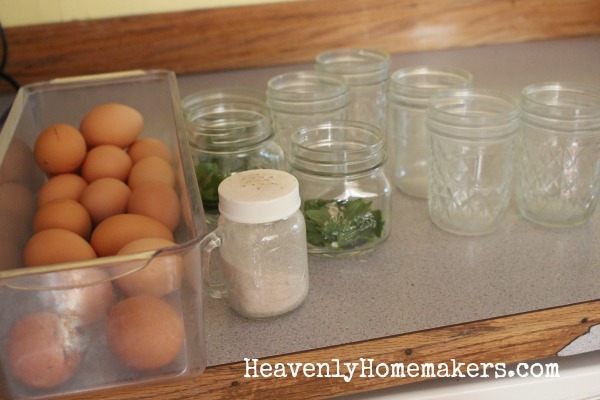 I’m curious, just because I’m fairly certain some of you might be shocked about our egg consumption…how many eggs does your family go through in a week?